This game is not just part of the Revenge Tour for Tom Brady, but revenge on a former team for Darrelle Revis. So, it’s a game worth watching. Which is more likely, a lock or an upset? Well, it is a semi-lock but the Jets have had absolutely amazing stats this season, and they could be a threat to the Patriots. So, lets get in to the details. Super bowl winning team vs biggest improvement of the season. So, lets get into the details. Who will win this huge game? So, the Jets might have a tough defense, but Brady’s bunch is better. If Dion Lewis and Brandon Bolden are hurt, they’re not great in RB depth, with Blount being guarded by Sheldon Richardson. But the passing game should still have weapons. Even if Edelman and Gronk have Revis and Antonio Cromartie. But Brandon LaFell is back, and Danny Amendola and Scott Chandler are also amazing, so the Patriots can squeeze out some scores. And the Patriots defense is underrated. However, so is the Jets offense. Chris Ivory and Zac Stacy are done when facing Jerod Mayo, Chandler Jones and Rob Ninkovich. Brandon Marshall will also be guarded by Malcolm Butler and Devin McCourty. 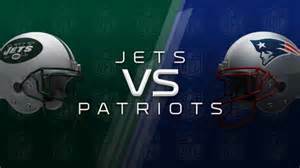 And Patrick Chung might guard Eric Decker, but they are closing in on the Jets way better than the Jets are on the Patriots. Lets look more in depth at all these injuries and my opinion on them. Marcus Cannon (Toe, DNP) – He seroiusly got hurt after Nate Solder went on IR? Rufus Johnson (Illness, DNP) – He doesn’t have a major role on the team anyways. Jabaal Sheard (Ankle, DNP) – This is a pretty big loss, not good. Brandon Bolden (Hamstring, LP) – This really cuts the RB depth with Lewis already hurt.